If you spend a couple of minutes talking to anybody that has invested in the stock market for very long, you’ll almost inevitably hear them throw out a few of their favorite idioms. That’s because while sometimes they seem simplistic, obvious, or perhaps even a little silly, the truth is that many of them are useful for framing the way you need to think about the market, or about any individual investment in practical terms. “Invest in what you know,” “buy a good company at a nice price,” and “the trend is your friend” are just a few examples of some of the nuggets I’ve learned to rely on. Another popular idiom is the notion that “a rising tide lifts all ships.” There are a couple of ways you can use that saying: in the broadest sense, it suggests that if conditions for the broad market are favorable, picking a good stock to buy isn’t much harder than picking out something useful, even if you only know a little bit about it. I prefer to think of the saying in a little more concentrated fashion; for me, it makes more sense to apply it on a sector or industry basis. It seems logical, for example, that if the semiconductor sector in general is increasing in value, semiconductor stocks in general should be a pretty safe bet to make. Apache Corp (APA) is an interesting case study for what I mean. 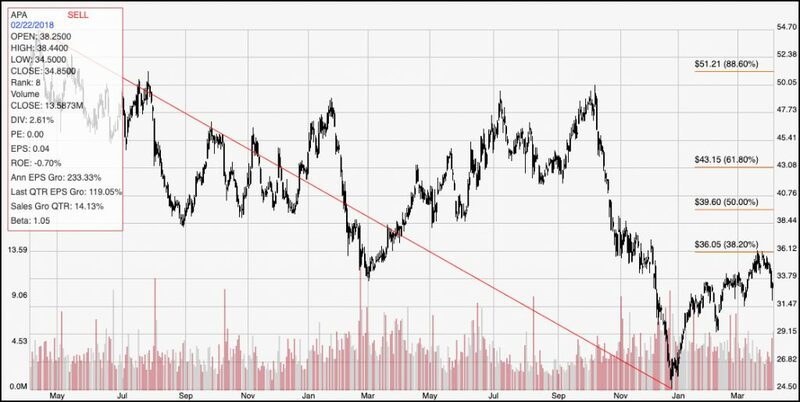 This is an oil exploration and production company in a multi-year downward trend that looked like it might be about to reverse at the end of the summer of 2018, but instead turned back down to drop more than 50% in price before the end of the year. The surge in oil prices has helped the stock rebound pretty nicely if you were lucky enough to pick its bottom at around $25 per share, with an increase from that point of about 25% as of this writing. If you stop there, you could easily say that the rising tide of oil prices helped lift the stock price of APA, and you wouldn’t be wrong. The problem is that simplistic conclusion doesn’t really consider the entire picture; it isn’t just about what the stock has been doing, but also about whether it has a reason to maintain the bullish momentum it’s been seeing up to this point. Increasing oil prices should mean that companies on the hard, sometimes ragged edge of the oil business, like APA are able to give their shareholders demonstrable improvements in their balance sheet and their long-term prospects. Not too long ago, when oil prices were still in the mid-$40 range, I read an interview with the CEO of Marathon Oil Corp (MRO), a company that competes directly with APA. He suggested that drillers and explorers throughout the segment should be profitable as long as oil prices held above $45 per barrel. If the idea that “a rising tide lifts all ships” is correct, that should mean that with oil prices well above that minimum mark, APA should be doing extremely well, with expectations of continued prosperity for the foreseeable future. Where do they really sit? Let’s find out. Apache Corporation is an independent energy company. The Company explores for, develops, and produces natural gas, crude oil and natural gas liquids. The Company’s production segments include: the United States, Egypt and the United Kingdom North Sea. It also pursues exploration interests in Suriname. In North America, the Company has three onshore regions: The Permian region, The Midcontinent/Gulf Coast region. The Permian region located in West Texas and New Mexico includes the Permian sub-basins, the Midland Basin, Central Basin Platform/Northwest Shelf and Delaware Basin. The Midcontinent/Gulf Coast region includes the Granite Wash, Tonkawa, Canyon Lime, Marmaton, and Cleveland formations of the West Anadarko Basin, the Woodford-SCOOP and Stack plays located in Central Oklahoma, and the Eagle Ford shale in South East Texas. APA has a current market cap of about $2.5 billion. Earnings and Sales Growth: Over the last twelve months, earnings declined by -6%, while revenue increased about 11%. The pattern is much more negative in the last quarter, where earnings dropped by nearly -51%, and sales -11%. The company’s margin profile is a big red flag; over the last twelve months, Net Income was only .5% of Revenues, and in the last quarter it turn sharply negative at -21.5%. While oil prices have been increasing, APA is seeing negative earnings and revenue growth – a clear sign that the industry’s rising tide isn’t lifting all ships in the same way. Free Cash Flow: Over the last twelve months, APA had only $11 million in Free Cash Flow. That is very minimal, although it does mark an improvement from a year ago when Free Cash Flow was negative. Their Free Cash Flow is hardly worth thinking about, at only .08%. Debt/Equity: APA’s debt to equity ratio is .91, which generally should imply the company maintains a conservative philosophy about leverage and debt management. The company’s balance sheet shows about $714 million in cash and liquid assets against a little over $8 billion in long-term debt. When you consider the weak Free Cash Flow and negative Net Income I just mentioned, I read the fact that cash has declined from more than $2 billion at the end of 2017 as a clear sign the company is burning through cash. For now, they can probably keep up with debt payments, but I believe liquidity is a legitimate concern. Dividend: APA’s dividend is $1.00 per share and translates to an annual yield of 3% at the stock’s current price. Price/Book Ratio: there are a lot of ways to measure how much a stock should be worth; but one of the simplest methods that I like uses the stock’s Book Value, which for APA is $23.22 and translates to a Price/Book ratio of 1.43 at the stock’s current price. The stock’s historical average Price/Book ratio is 2.25, meaning that the stock is currently sitting more than 50% below that average. That puts a long-term target price for the stock at about $52 per share. The stock is also trading about 65% below its historical Price/Cash Flow average. That is tempting, speaking strictly from a value-based perspective; however I don’t think the company’s fundamentals support that value argument. This looks like a case of “buyer beware” to me. Current Price Action/Trends and Pivots: The red diagonal line measures the length of the stock’s downward trend from around $55 beginning in May of 2017, until the end of December when it bottomed around $24.50; it also informs the Fibonacci trend retracement lines shown on the right side of the chart. The stock has rallied about 30% from that low point. Since the end of February, with a pretty consistent pattern of higher highs and higher lows continuing right up to now. The stock is currently retracing from a pivot high right at the 38.2% retracement line, marking resistance at $36 per share and support at around $32. Near-term Keys: APA is a stock that I simply couldn’t justify working with on any kind of a long-term basis right now. If you want to work with oil-related stocks, and don’t mind the volatility that is normally associated with them, the prospect of continued strength in oil prices should bode well for the industry at large; but there a lot of other names that operate in the same space as APA that I think are better suited, from a fundamental and value standpoint, for a long-term investment. The stock’s short-term technical pattern is interesting, however and so there could be some opportunities to place short-term, momentum or swing-based trades depending on whether the stock can maintain its short-term upward trend. If the stock breaks above $36, you might consider buying call options or the stock outright, with an eye on resistance at the 61.8% retracement line at around $43. A break below the trend’s current support, at $32 would be a good signal to short the stock or buy put options with an eye on the stock’s trend low point around $25.